It starts from the backyard of the Dubai Marine Beach Resort up to the Burj Al Arab Hotel. The project comprises the construction of a five-metre wide walkway, a four-metre wide jogging track, rest areas including retail kiosks and shaded benches overlooking the beach. Mattar Al Tayer, chairman and executive director of the RTA, said the Jumeirah Corniche project “hugs the sand beach and offers a vibrant environment fitted with aesthetic and recreational features as well as public utilities for the use of beach goers”. 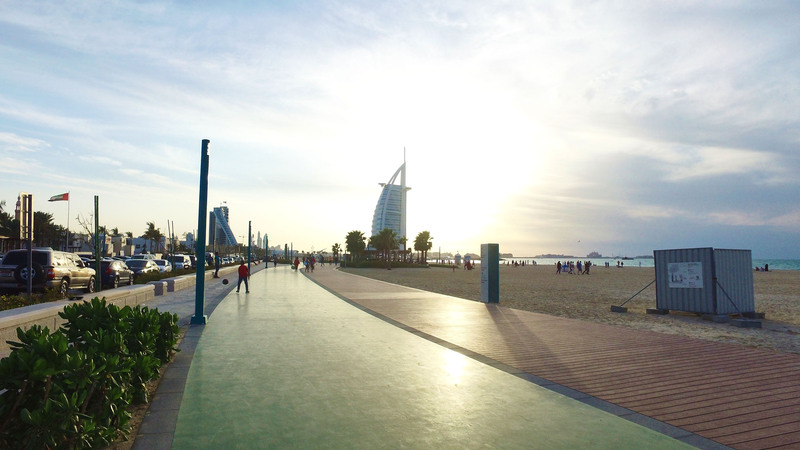 The Jumeirah Corniche is considered a gorgeous addition to the area offering relaxation and relief and greater opportunity for the public to enjoy and practice several activities in addition to high-class service facilities for citizens, residents and tourists to enjoy a time out, swim or practice sport. In the future, the Jumeirah Corniche will be linked at a later stage with the Walk and the jogging/walking tracks of the Dubai Water Canal; a new urban destination in the making for the regional and international tourist movement as well as for the populace of the emirate.